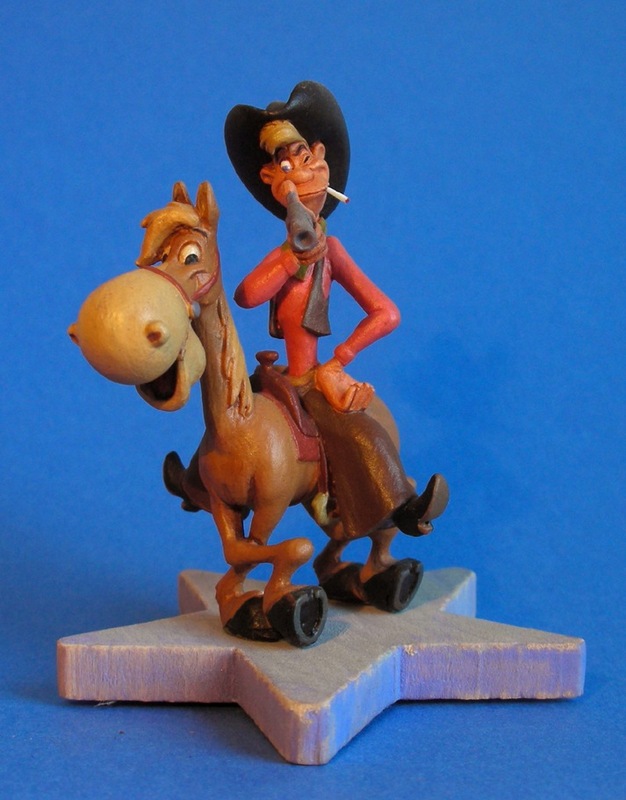 Disney | 50 Westerns From The 50s. Raleigh and much of the rest of North Carolina are still reeling from Saturday’s tornadoes. It breaks your heart to see all the destruction and hear of the lives and homes lost, but it’s great to watch people bouncing back, helping each other out and just generally being Good. Raleigh sure coulda used Bill last Saturday. 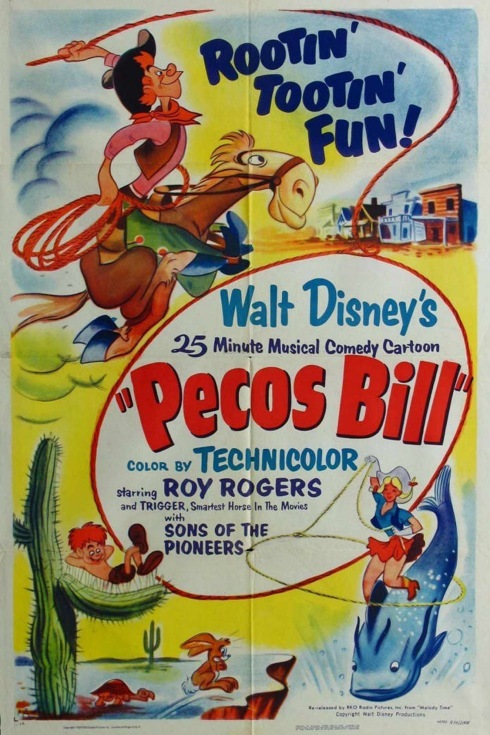 The wonderful Pecos Bill record, complete with MP3s and original artwork, was featured as part of the Kiddie Records Weekly project. Here. He’s Week 15. As a kid, I played this LP (a Camden re-issue with Johnny Appleseed on the other side) till the grooves were practically gone. (Explains a lot, I guess.) Go get it, folks! As a true corrupter of youth, I felt compelled to search out an image of Pecos with a cigarette hanging out of his mouth. I’m getting tired of writing these posts. 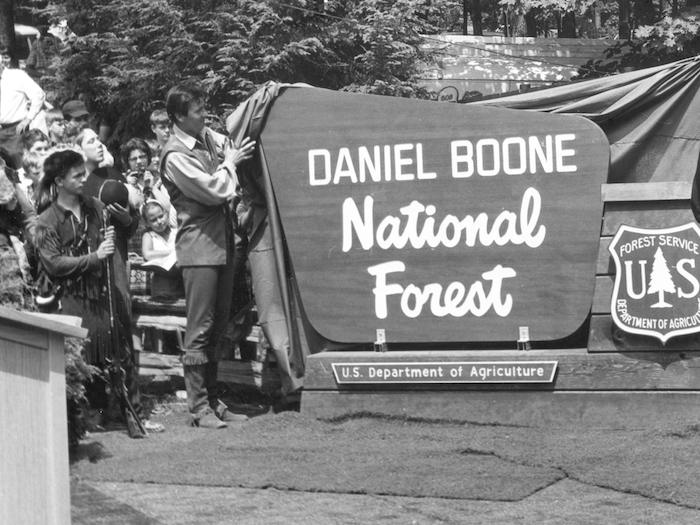 Fess Parker — Walt Disney’s Davy Crockett and later TV’s Daniel Boone — has passed away at 85. Before those iconic roles, he appeared in The Bounty Hunter (1954, starring Randolph Scott) and the giant-ant masterpiece Them! (also ’54). It was in the later picture that Walt first saw him. 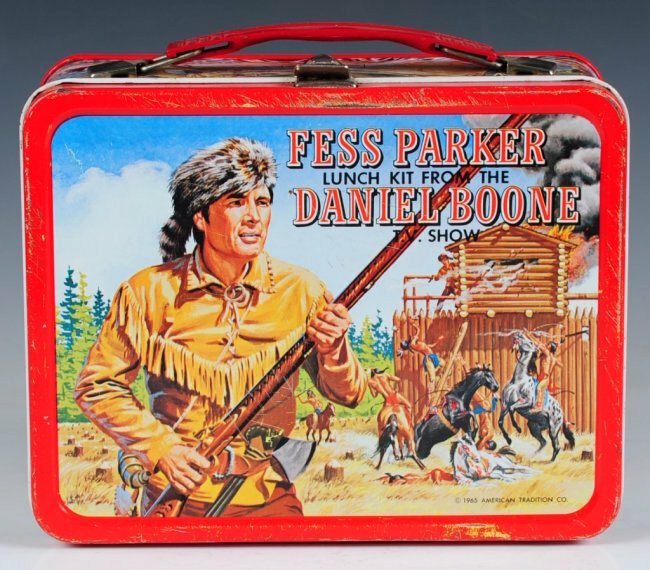 Parker was considered for the part in The Searchers (1956) that went to Jeffrey Hunter, but Disney was hesitant to loan him out in the middle of the Crockett craze. Fess told Michael Barrier that story (and others) in an excellent interview. 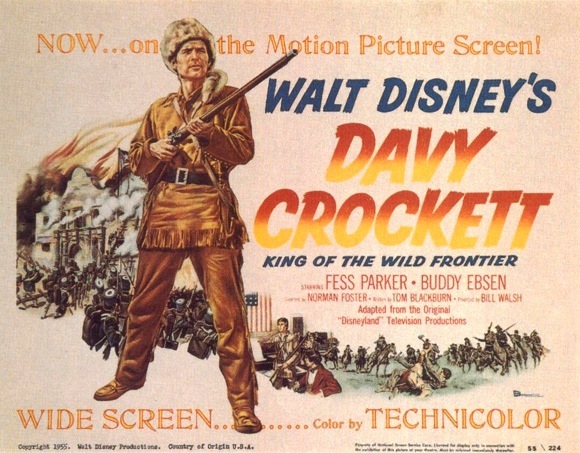 The title card above is for the feature Davy Crockett, King Of The Wild Frontier (1955), edited from the first three Crockett episodes of Disneyland. On vacation in Orlando, Florida. 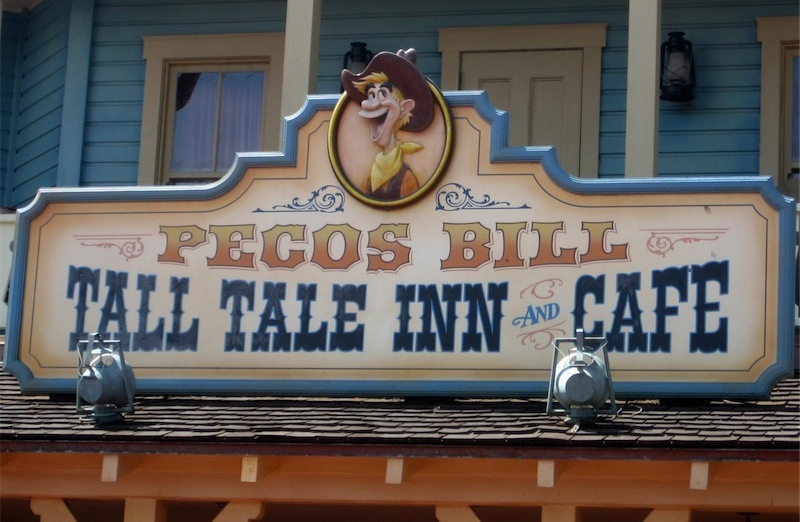 At Disney World last night, I passed by Pecos Bill’s Tall Tale Inn & Cafe. It’s one of WDW’s better quick-service places (though I didn’t eat there this trip). It reminded me just how wonderful the Pecos Bill segment of Melody Time (1948) is. The early scenes — with Roy Rogers and The Sons Of The Pioneers singing “Blue Shadows On The Trail” around the campfire in an animated desert — I’ve always thought were jaw-droppingly beautiful. 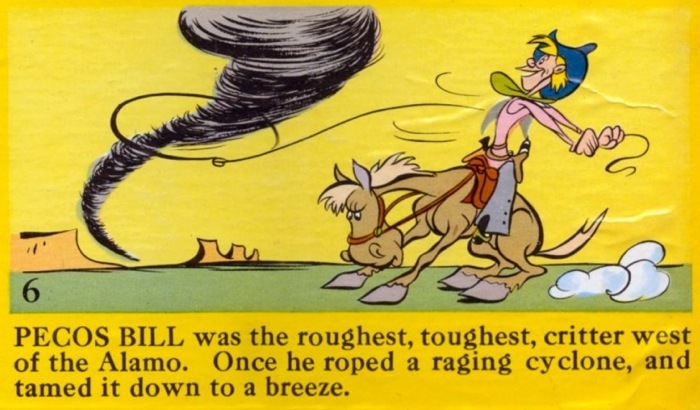 However, even as a six-year-old — when I wore out the soundtrack record — I found it weird that a goofy-looking guy like Bill could land a dish like Slewfoot Sue.